The future of work. Delivered today. Sapho empowers employees with a modern portal experience that surfaces personalized and relevant tasks and data using micro apps. Sapho micro apps, built by IT on top of existing systems, simplify workflows and data access and allow employees to complete work faster and make better decisions, improving their productivity and effectiveness. Do your employees struggle to access and analyze information that sits across multiple systems? Do they delay completing tasks that require they login to yet another system? Employees are now pushing back against legacy systems – both on-premises and SaaS – and demanding more modern applications to complete their work. Unfortunately, you have spent millions of dollars on software and replacing them is not an option. The question: how do you meet employee expectations for more user-friendly tools without costly upgrades or throwing out your existing systems? Answer: a modern portal. 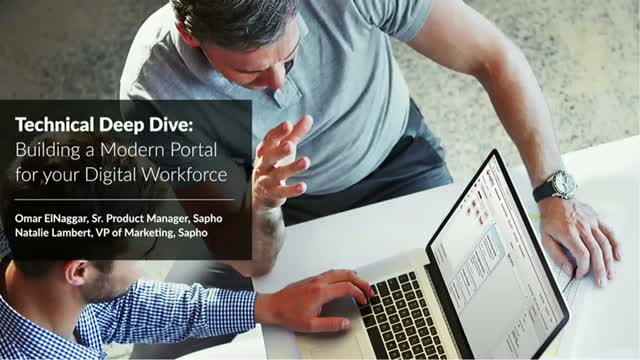 Sapho’s modern portal surfaces personalized and relevant tasks and data to employees using micro apps. Sapho micro apps are built by IT on top of your existing systems using a simple micro app builder and pre-built templates. These micro apps – available on any device, intranet, or messenger app – provide employees with proactive notifications about interesting system data, actions that need to be completed, and changes in business data that require attention. With Sapho, employees can complete work faster and make better decisions, improving their overall productivity and effectiveness. Enterprise systems are failing today’s employees because they are hard to use, they trap data in silos, they have a poor user experience, and they offer limited mobile support. Therefore, it is no surprise that a Forrester Research study showed that 76% of employees believe it takes too long to complete tasks in their systems and another 62% delay completing tasks that require multiple systems. In short, this means your business has delays. On the flip side, consumer applications keep getting better and better – these apps are simple, enable quick task completion, are accessible from anywhere, and offer a great user experience. Why can’t enterprise systems be as easy to use as consumer apps? It turns out, they can be. Modern portals are the next generation digital workplace tools that push data and key actions to employees from their systems so they can more effectively do their jobs. •Remove system bottlenecks, reduce helpdesk calls, decrease software spending, enable smart decision-making, and streamline workflows with consumer-like business apps. •Build smart, event-driven micro apps that sit on top of your existing systems and push actionable insights and tasks to employees on any device, intranet, or messenger. •Triple the productivity of your workforce with a modern portal that surfaces personalized and relevant tasks and information from all your systems. Watch how Sapho can triple employees productivity. Explore Sapho in 3 minutes! Watch this quick demo of how easy it is to build micro applications and deliver them to your employees on any device, messenger, or intranet. Business requirements and technology are changing constantly, but enterprises often find that their business apps are frozen in time. Businesses need solutions that deliver innovation but focus on integration with existing infrastructure. This 30 minute webinar, featuring Forrester Research analyst Michael Facemire and Sapho CTO Peter Yared, discusses how simple micro apps will drive business transformation.